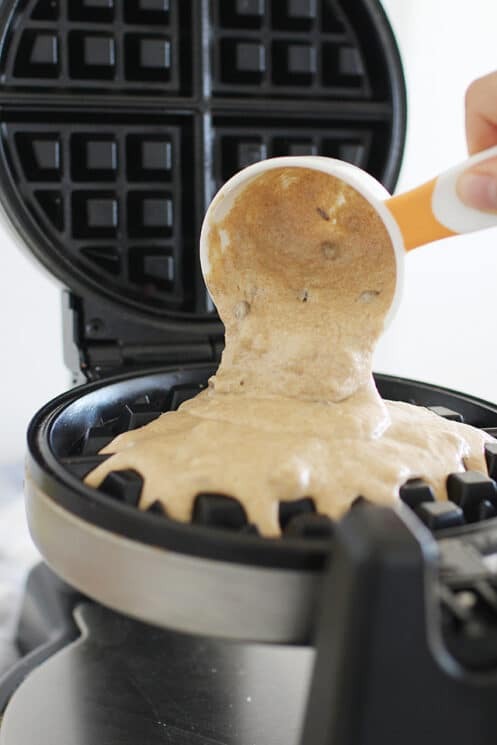 Healthy waffles have never been easier! 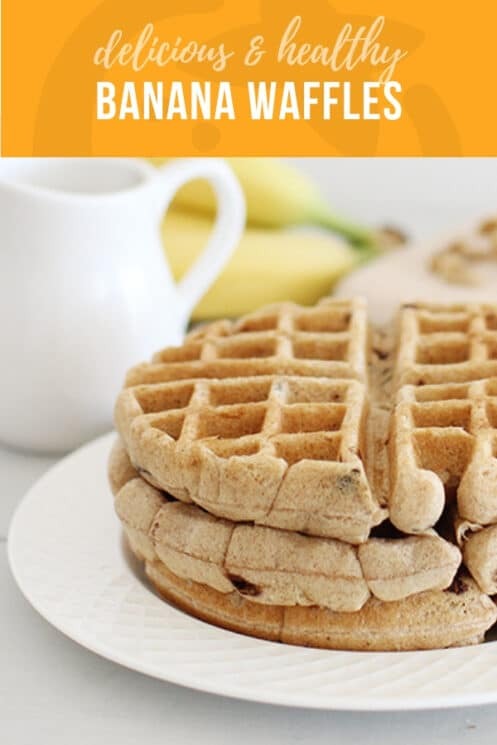 Try our our recipe for Banana Waffles today! Pancakes and waffles are so easy to “hide” nutrient rich fruits and nuts! Hiding nutritious foods really is just adding them to foods that your kids already like. On Saturday we set out to make our typical waffle recipe, but this time, we puréed some banana, ground up some walnuts for a little extra nutrient hiding, and the kids loved them! 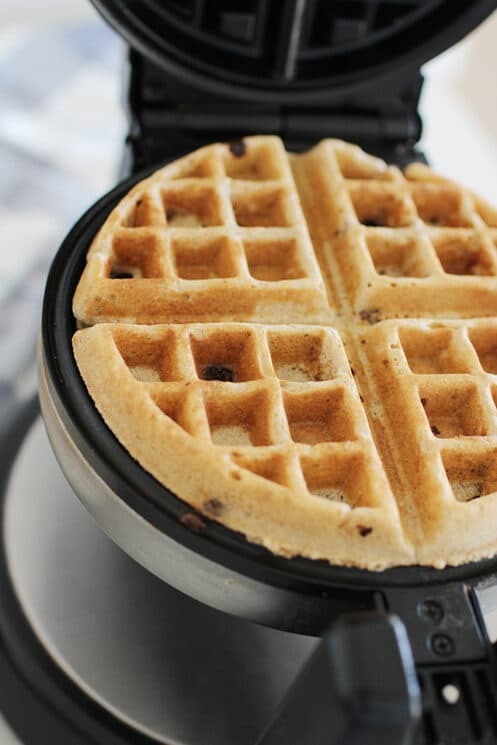 This recipe can make 10 waffles, which is great news if you want to make them all and freeze some (a full list of foods we like to make for the freezer can be found here). You can also cut the recipe in half and have just enough for your breakfast today. I love that the banana is inside the waffles, and doesn’t need to be a “topping”. Sometimes, it’s just easier to get kids to eat a fruit or veggie when it’s incorporated completely into the mix. It also makes a great finger food if you can have the healthy nutrients inside the batter rather than on top. What is the best waffle iron? Belgian waffle iron– With deeper grooves, Belgian waffles are thicker and tend to be crispier on the outside, and tender inside. Non-stick -Many non-stick surfaces for pans and appliances are coated with Teflon. This coating may peel at high heats and create toxic fumes. With so many other non-stick surfaces available today, it’s easy to stay away from Teflon. Ceramic – Ceramic is a safe, non-stick alternative to Teflon and many waffle makers are coated or dipped with ceramic clay. Because ceramic is good for cooking at low to medium temperatures, it makes a great surface for waffles that don’t need to get too hot. Stainless steel – Stainless steel is easy to clean and can reach high temperatures well. Copper titanium– This newcomer to the market can withstand heats up to 850 degrees and is very durable. Shapes– Waffle makers have become a collectible! You can now make waffles in the shape of Texas, Mickey Mouse, circus animals and so much more! Rotating- I actually do own a rotating waffle iron. You pour the batter on your waffle plate, close the lid, and flip it over. I think it helps the waffle to spread and cook more evenly. Double decker – Making a lot of waffles, these double deckers are brilliant! My sister in law has one, and cooking waffles in half the time is AMAZING! So, I’d love to know!! WHAT’S YOUR FAVORITE WAFFLE IRON? Puree one banana (leave the second one for topping the waffles). Add to a large bowl along with all other ingredients. Stir just until combined (it will be lumpy). Fold in walnuts and chocolate chips. Cook waffles as directed by manufacturer instructions. 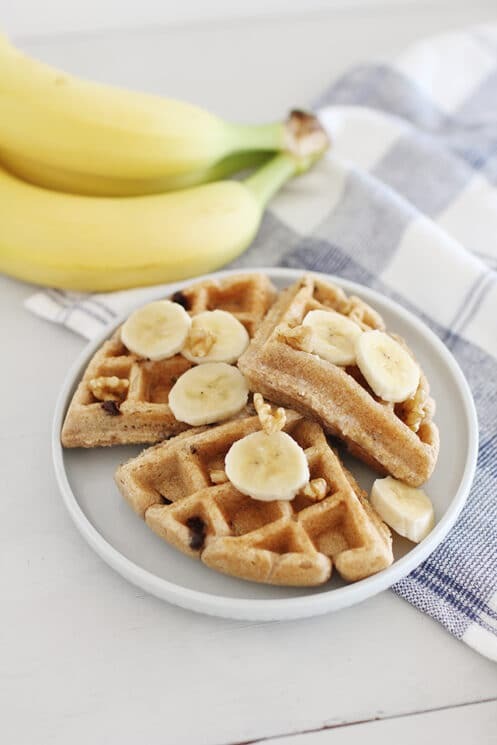 Top waffles with butter, syrup and sliced bananas. We can’t do nuts at our house-the hubs is allergic:( I would love these though! I love making whole wheat waffles with fruit toppings. No syrup necessary, just fruit. Sometimes I will add a dallop of yogurt too, instead of whip cream. I also like to sneak in wheat germ, flax seed to my whole wheat mix. Oh-and I teach kids cooking classes on by appointment. If you know of anyone that is interested, let me know:) Thanks! We like pumpkin waffles! I got this recipe this fall, and my family fell in love! So yummy!! What a great idea! 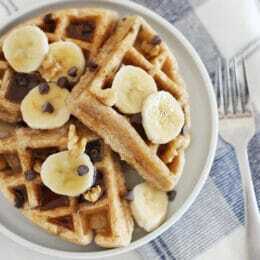 I am adding some pureed fruit and nuts next time I make waffles! YUM! We made waffles last night. 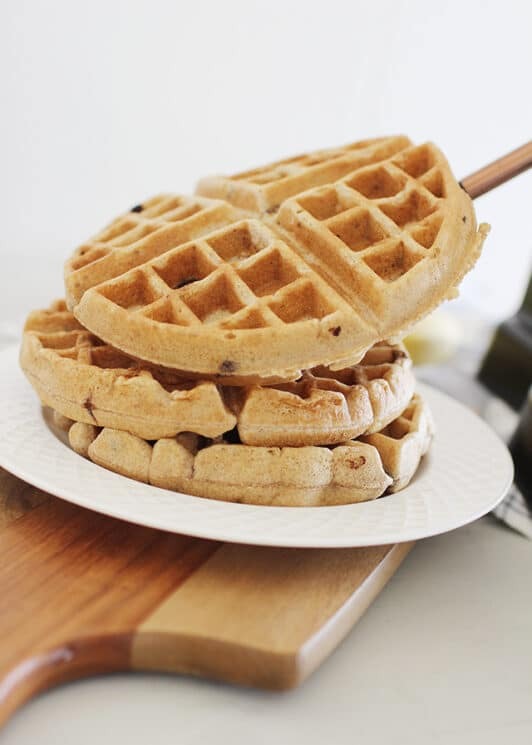 I like to make cinnamon waffles – add a couple of TBSP of cinnamon to the mix and a handful of cinnamon chips (King Arther company makes trans-fat free cinnamon chips). Love the looks of your recipe and will definitely try it soon! I can’t wait until you post the recipe! It looks so amazing. My co-blogger and I are getting ready to create a new waffle recipe too using bananas and cocoa (a banana chocolate waffle). We’re also getting ready to record a podcast dedicated to waffles! If you visit Meal Makeover Moms’ Kitchen any time after Feb. 9th, we’ll be hosting a Cuisinart waffle maker giveaway (all you have to do to enter is post YOUR favorite waffle recipe)! So fun…. I am wondering, how many bananas did you use, and how much chopped walnuts? Thank you! I usually use one or two bananas, and likely 1/4 cup of nuts! Good luck! Thanks! This is going to be our dinner tonight :0) Can’t wait to try them! I’ve made these this evening for my daughters breakfast for tomorrow. I already had a couple, they’re absolutely amazing ?? Can’t wait for my little girl to try them. Thank you so much for the wonderful recipes. Could u use spelt flour or other gluten free flour? Waffles are one of our favorite breakfast foods! Can i make pancakes instead? We don’t have a waffle maker. Absolutely! I’d just make the batter a little thinner with more liquid, and you’ll be good! So so good! But it makes SO much – can you make ahead and freeze or refrigerate the batter? Hi Ashley! I’m so glad you liked them. I think the batter would go flat if you tried to store it, so I don’t recommend that. BUT, the prepared waffles freeze beautifully! We like to stack them inside gallon freezer bags and warm them up in the toaster oven for quick breakfasts. I hope this helps solve the problem of having too much!